When my kids are craving for some fried chicken and they want it within 30 minutes, Kara-age is the way to go. 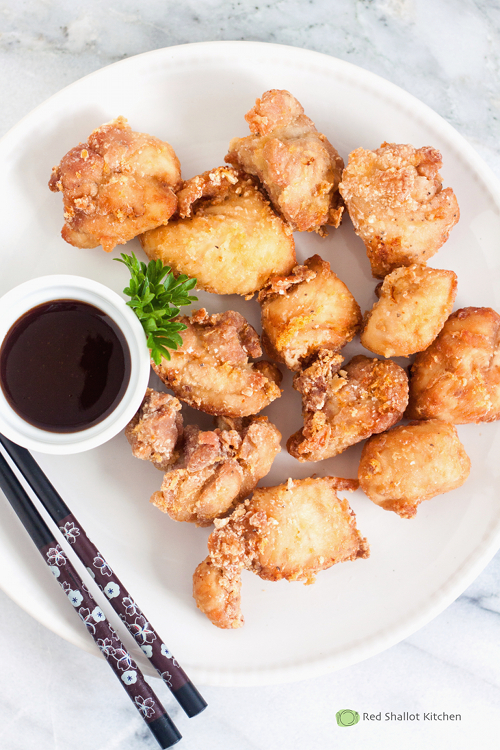 Unlike other types of fried chicken, Karaage doesn't take all day to make. Just a quick marinate, coat with potato starch, then deep fry to produce flavorful crispy fried chicken everybody will enjoy. Drizzle with liberal amount of lemon juice before serving. 1 lb boneless chicken thigh, preferably with skin, cut into 2-inch pieces. In a large mixing bowl, combine garlic, ginger, soys sauce, sake, salt and pepper. Add chicken pieces into the marinade, mix well. Cover the bowl with plastic wrap and store in the refrigerator for 20 minutes. Heat the oil in the frying pan to 350 F. Dust the chicken in potato starch, fry in the hot oil until golden brown. Transfer the chicken to paper towel to absorb excess oil. Serve immediately while they're hot. All updates about upcoming event T20 World Cup 2016 Live Streaming . Live Commantory, Live Streaming, Updates, Ball by Ball Score and T20 Schedule, team squard, Team kits and fixtures. Amezing,you can share father's day quotes, messages and greetings. You can watch Tour De France 2016 live streaming. hank you for such a sweet tutorial - all this time later, I've found it and love the end result. I appreciate the time you spent sharing your skills. Thank you for sharing your thoughts. I really appreciate your efforts and I am waiting for your next write ups thank.